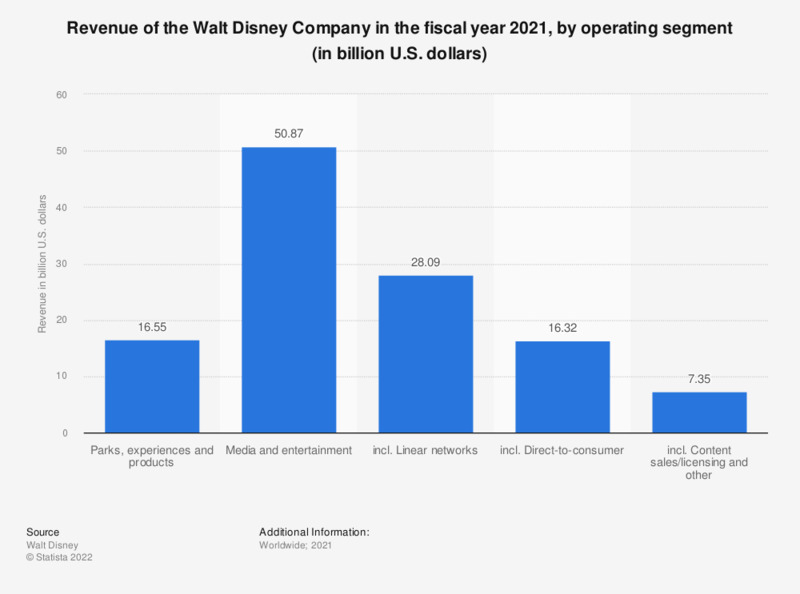 This statistic contains data on the global revenue of the Walt Disney Company in the fiscal year 2018, broken down by operating segments. That year, the Walt Disney Company generated a total revenue of 20.3 billion U.S. dollars with its parks and resorts segment. The company's biggest segment was its media networks, which generated revenue of 24.5 billion U.S. dollars in 2018. This marks a significant increase from the 15.86 billion U.S. dollars of revenue generated in this segment in 2008. The total assets of the Walt Disney Company amounted to 95.79 billion U.S. dollars in 2017. In 2016, the Walt Disney Company generated over 40 percent of its revenue through its media networks– i.e. ESPN, Disney Channel, Hulu or the ABC Television Networks, among others. This revenue stream brought the company 23.69 billion U.S. dollars, up from 20.36 billion in 2013. Parks and resorts were the second-largest revenue source, generating a total of 16.97 billion U.S. dollars. It is a very successful segment – Disney’s parks take places 1 to 9 in the ranking of the most visited amusement and theme parks worldwide. The Magic Kingdom Park in Bay Lake, Florida, ranked first in 2015 with 20.49 million visitors. The third-largest revenue stream – with 9.44 billion U.S. dollars – was studio entertainment or Disney’s film business. Buena Vista, a subsidiary of the Walt Disney Company, generated over three billion U.S. dollars at the North American box office in 2016, an increase of almost 100 percent on 2012. This amounted to a box office share of 26.3 percent in 2016, thanks to blockbuster films such as "Rogue One: A Star Wars Story", "Finding Dory", and "Captain America: Civil War". The Walt Disney Company reports its numbers based on fiscal years that end late September/early October of the corresponding calendar year. Everything On "Walt Disney Company" in One Document: Edited and Divided into Handy Chapters. Including Detailed References. Which is your favorite Disney princess? In your opinion, which of the following attributes should the future Disney princess have? How important do you think it is for Disney princesses to be a good role model for girls? Do you think the following Disney princesses are good or bad role models for girls? Do you think that the following Disney princesses are a good example for girls and little girls?